Keeping honeybees is fuelling the dramatic decline of Britain’s wild bumblebees because they compete for the same food, according to new research. The fashion for having a hive in the garden or on rooftops has done “more harm than good” because honeybees are less efficient pollinators than wild bees. Too many honeybees wipe out wild bees – because they compete directly for nectar and pollen. That’s not a problem when flowers are plentiful. But in areas with limited resources – like towns and cities – wild bees can be ‘outmuscled’. A lack of flowers is one of the main factors behind the drop in bees across the world – including the UK. Initiatives such as urban beekeeping put more pressure on wild bees and worsen the decline. 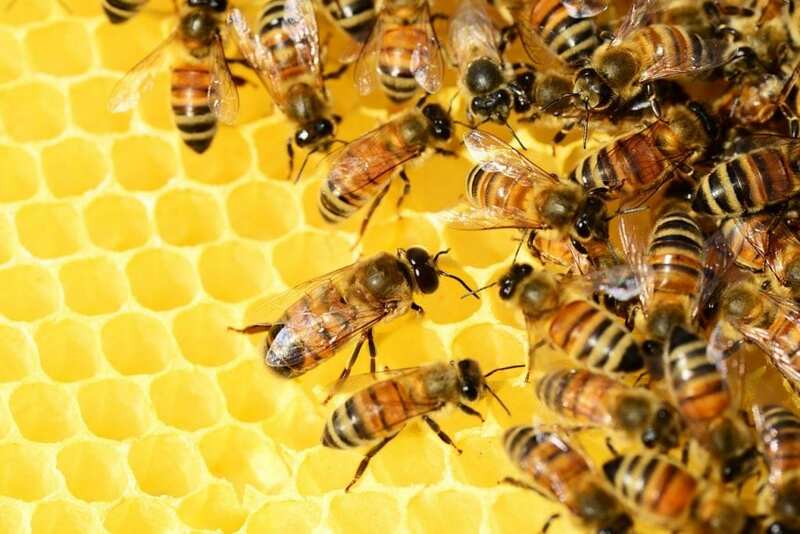 Dr Olivia Norfolk, a lecturer in conservation ecology at Anglia Ruskin University in Cambridge, said: “Honeybees are extremely efficient at collecting pollen and returning it to their hives. “But as a consequence they transfer little to the flowers they visit. “They are quantifiably less effective at pollination than wild bees, so changes in foraging patterns also have knock-on consequences for the plant community. “When honeybees occur in high numbers, they can push wild bees out of an area, making it harder for wild plants to reproduce. Hives are regularly traded locally and internationally – allowing the rapid spread of diseases and parasites such as deformed wing virus and Varroa mite that are wiping out bees. These pathogens can spill over from managed hives into wild populations – spreading between species when they visit the same flower. Dr Ruskin said responsible beekeepers should take steps to control pathogen levels within their hives to minimise transmission to wild bees. She said: “When considering the evidence, the rise in amateur beekeeping is likely to cause more harm than good. “No one will deny the value of our British beekeepers and the wonderful honey they provide. These include planting bee friendly flowers rich in pollen and nectar with a wide range of floral shapes and colours to increase the number of species attracted to your garden. Wooden decking and concrete paving may be low maintenance, but impenetrable surfaces prevent ground nesting bees from finding a home. Increasing the size of flowerbeds lets you plant more flowers and creates space for more bees to locate nesting sites. Cavity nesting bees look to nest in masonry or old plant stems, but you can provide them with additional nesting sites by buying or building a ‘bee hotel’. The EU recently extended its ban on the agricultural use of neonicotinoid pesticides in acknowledgement of the harm they cause to bees. These same chemicals are still found in common garden pesticides, so do your best to minimise their use. Many fast growing ‘weedy’ plants provide rich sources of pollen and nectar, so ditch the weedkiller and let the wild flowers grow. Lazy gardeners who mow their lawn less frequently can also expect to see a rise in bee abundance of up to 30% due to the increase of dandelion and clover. Writing in The Conversation she said it’s no secret bee populations are in decline across the world. This has led to a huge increase in public awareness over the past few years – leading many to set up hives. Membership of the British Beekeepers Association (BBKA) has almost tripled in a decade – rising to more than 24,000 from about 8,500 in 2008. Many live and keep bees in towns and cities. Dr Ruskin said: “But this might not be as helpful as you may think. Managing hives does nothing to protect our wild pollinators. The UK is home to around 270 bee species. Most people are familiar with the charismatic bumblebees, but the 250 species of solitary bee remain lesser-known. As the name suggests, they don’t live in hives or colonies, but nest alone in cavities or underground.